First, do the ground work. It’s very difficult for most people to come up with a good speech “off the cuff.” It’s so easy to get flustered and lose your train of thought when you find yourself standing in front of an audience. If you’re not adequately prepared, you’ll forget all those great stories you wanted to tell and you’ll end up feeling like you didn’t deliver a good best man speech. Spend time writing down some thoughts about things like how you got to know the groom and the bride. Think of various words you would use to describe them. List things you know about how the two met and how the groom’s life has changed since meeting his bride. All of these things can help jog your memory to come up with good stories to tell. If you’re married you can offer advice, playful or serious. Or you can relate advice that has been given to you that you found helpful. Make sure you keep it positive. Try to recall amusing stories about the couple or stories that reflect their true character. Under no circumstances do you ever bring up any past relationships of the bride or groom, even if you find them entertaining. Begin your speech by introducing yourself to everyone attending and explain how you know the groom. You should thank the groom for including you in this important day. Also be sure to respond appropriately to any comments that have come before yours in previous speeches, as well as thanking those hosting the wedding. Next, you should thank the wedding couple for any gifts you’ve received as a member of the wedding party. This is a good time to inject humor if you’re comfortable doing so. It loosens you and everyone else up, gives you a little boost of confidence and helps you segue into the rest of your speech. Now you’re into the main part of your speech. You might choose to tell funny anecdotes about the groom , especially if you’ve known each other for a long time. You can also pull stories from the couples’ courtship, from the wedding day preparations, even from the bachelor party. Just be sure not say anything off color or that would embarrass anyone. You want to avoid making your speech a stand up comedy routine, so it’s a good idea to balance things out with some more serious, even sentimental, touches. You could use this opportunity to relay messages from people who were unable to attend the wedding, or read messages from cards sent by them if the bride and groom ask you to. As you near the end of your speech you could again thank the couple for including you and wish them a long and happy married life together. 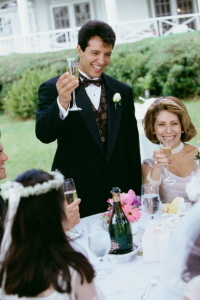 Then, ask everyone to raise their glass for a toast to the happy couple. Depending on how formal the reception is, if there’s no master of ceremonies you could end your speech by announcing what’s going to happen next, like cutting the cake, or introducing the next person who’s giving a speech. 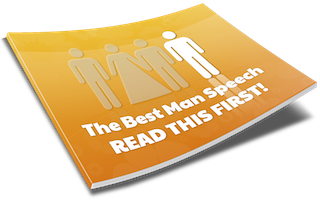 Category DIY Speeches | Tag best man speech | Bookmark the permalink.